The Bahrain Grand Prix starts in the late afternoon at 6pm and ends in the evening under the floodlights: one of only three races that rely on artificial light. It is a track that has produced some tense strategic battles in the past, over a challenging circuit. 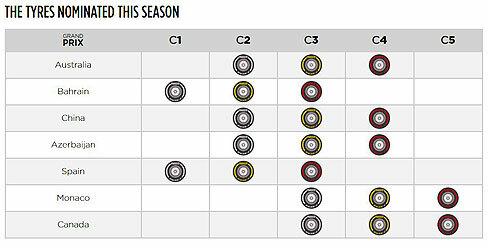 The three hardest compounds in Pirelli’s range (C1, C2 and C3) make up the hard, medium and soft nominations respectively – coloured white, yellow and red as usual this year. - The track surface at Bahrain is very abrasive, having originally been build using granite from England: one of the reasons why the hardest compounds are selected. - Track temperatures can fall quite dramatically as the race heads into the evening. This can have an effect on strategy as well, by lengthening the stints. - A one-stopper was the winning strategy last year in Bahrain, although most drivers stopped twice. The race came down a highly tactical battle, with many drivers completing long stints. - Bahrain is all about acceleration, braking and traction rather than fast corners, and it is a rear-limited track – making it important to look after the rear tyres. - The late afternoon race and qualifying means that FP2 is the only directly relevant free practice session, so the majority of simulation work will be compressed into those 90 minutes. - The Bahrain Grand Prix will be followed by the first in-season test of 2019, on Tuesday and Wednesday. McLaren and Toro Rosso will dedicate two days of testing to Pirelli’s 2020 prototype tyres, each running a second car on both days for this purpose. - The Formula 2 championship resumes in Bahrain with an exciting influx of new drivers including Mick Schumacher: son of seven-time world champion Michael Schumacher. - Unlike Australia, the Mercedes and Ferrari drivers have gone for identical tyre selections in Bahrain (as well as Red Bull’s Max Verstappen), while the other Red Bull of Pierre Gasly has taken a slightly different approach. - The first Formula 3 test of the season took place at Paul Ricard last week, with ART Grand Prix team driver Christian Lungaard topping the time sheets. A total of 30 drivers will take part in the new F3 championship this year.